UFOs and Aliens | Alien Evidence In Religious Art? UFOs and Aliens | The Hill Abduction Story An Interrupted Journey. 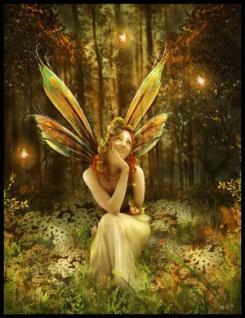 Who and what are fairies? Are they fallen angels who were not good enough to be saved, nor bad enough to be lost? Are they the gods of the earth or of pagan history? Are they the so-called Irish “Tuatha De Danan”, who when no longer worshipped und fed with offerings, dwindled away in the popular imagination, and now are only a few spans high? Who and what are fairies? Are they fallen angels who were not good enough to be saved, nor bad enough to be lost? Are they the gods of the earth or of pagan history? Are they the so-called Irish “Tuatha De Danan”, who when no longer worshipped und fed with offerings, dwindled away in the popular imagination, and now are only a few spans high? There is much evidence to prove them fallen angels. Witness the nature of the creatures, their caprice, their way of being good to the good and evil to the evil, having every charm but conscience – consistency. Beings so quickly offended that you must not speak much about them at all, and never call them anything but the “good people”. So easily pleased, they will do their best to keep misfortune away from you, if you leave a little milk for them on the window-sill over night. On the whole, the popular belief tells us most about them, telling us how they fell, and yet were not lost because their evil was wholly without malice. Are they the “gods of the earth”? Perhaps! Occultists, from Paracelsus to Elephas Levi, devide the nature spirits into gnomes, sylphs, salamanders, undines; or earth, air, fire and water spirits. The gnomes are covetous and of melancholic temperament. Their usual height is but two spans, though they can elongate themselves into giants. The sylphs are capricious and of bilious temperament. They are in size and strength much greater than men, as becomes the people of the winds. The salamanders are wrathful and in temperament sanguine. In appearance they are long, lean and dry. The undines are soft, cold, fickle and phlegmatic. In appearance they are like man. The salamanders and sylphs have no fixed dwellings. Many mystic writers – in all ages and countries – have declared that behind the visible are chains on chains of conscious beings, who are not of heaven but of the earth, who have no inherent form but change according to their whim or the mind that sees them. You cannot lift your hand without influencing and being influenced by hoards. The visible world is merely their skin. In dreams men go amongst them, play with them and combat with them. Fairies are not always little. Everything is caprious about them, even their size. They seem to take what size or shape pleases them. Their chief occupations are feasting, fighting, making love and playing the most beautiful music. They have only one industrious person amongst them, the Lepracaun, the shoemaker. They have three great festivals in the year: May Eve, Midsummer Eve, November Eve. On May Eve, every seventh year, they fight all round for the harvest, for the best ears of grain belong to them. On Midsummer Eve, when the bonfires are lighted, the fairies are at their gayest and sometimes steal away beautiful mortals to be their brides. On November Eve they are at their gloomiest, for this is the first night of winter. This night they dance with the ghosts, and the Pooka is abroad, and witches make their spells. Ater November Eve the blackberries are no longer wholesome, for the Pooka has spoiled them. When they are angry they paralyse men and animals, when they are gay they sing. Do they die? No, they are said to be immortal....if not their shapes, so their souls. The name “Lepracaun” is from the Irish “leith brog”, i.e. the One-shoemaker, since he is generally seen working at a single shoe. He is withered, old and solitary and dressed with all unfairy homeliness. He belongs to the mischievous phantoms and is a great practical joker among the good people. The Lepracaun makes shoes continually and has grown very rich. The Pooka seems essentially an animal spirit. Some derive his name from “poc”, a he-goat. He lives on solitary mountains and among old ruins – grown monstrous with much solitude – and is of the race of the nightmare. November-day is sacred to the Pooka because he is a November spirit. It is hard to realize that wild, staring phantom grown sleek and civil. He has many shapes – is now a horse, now an donkey, now a bull, now a goat, now an eagle. Like all spirits, he is only half in the world of form. The Banshee is an attendant fairy that follows the old families, and none but them, and wails before a death. Many have seen her as she goes wailing and clapping her hands. The keen, the funeral cry of the peasantry, is said to be an imitation of her cry. When more than one Banshee is present, and they wail and sing in chorus, it is for the death of some holy or great one. An omen that sometimes accompanies the Banshee is an immense black coach, mounted by a coffin, and drawn by headless horses. It will go rumbling to your front door, and if you open it a basin of blood will be thrown in your face. Did Extraterrestrials Visit Earth Long Ago?